Heated Storage – Rapid changes in humidity can cause the degradation of stored paper products and other materials. Our facility is heated to ward off moisture. That means a longer shelf life for your records and files. Security Features – When you choose commercial storage in Mill Creek, you expect that your business items will be looked after. Because we care about our customers, we provide only the best security features. Every unit is individually alarmed and monitored by a digital surveillance system. Keypad access is also required to enter our facility. 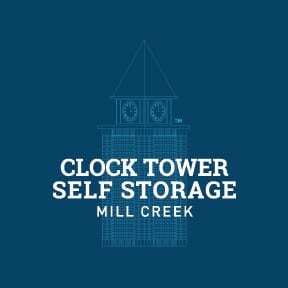 Peace of Mind – At Clock Tower Self Storage - Mill Creek your trust is important to us. That is why we go the extra mile for you. We offer a FREE* truck rental at move-in. This serves to expedite the moving process so that you can get back to what really matters, running your business. *Restrictions apply. Contact manager for more details.